The state's top leaders celebrated the beginning of their second terms in front of their biggest supporters. AUSTIN, Texas — Following a day of inauguration activities, Texas Gov. Greg Abbott and Lt. Gov. Dan Patrick celebrated the start of another term with some of their biggest supporters -- and a special musical performance. Thousands of people packed the Parmer Events Center near downtown Austin Tuesday night for the Texas Inaugural Ball. "We would not be here tonight without you. You made tonight possible. Thank you, Texas," Abbott told his supporters. 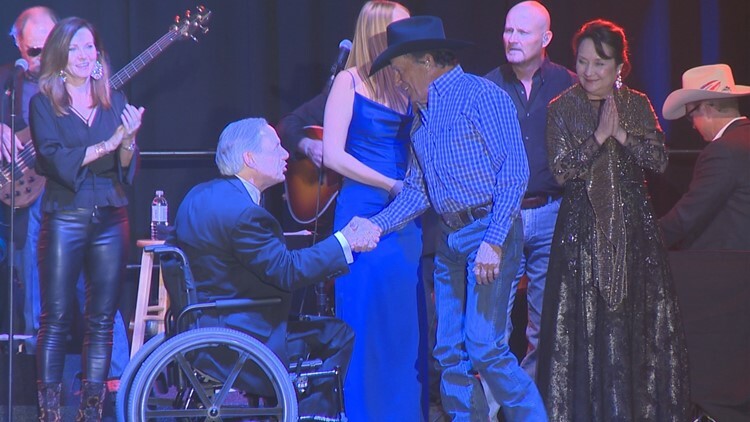 Both Abbott and Patrick made brief on-stage appearances at the ball, with most of their focus being on country music star George Strait. "The night that I won re-election, I knew immediately who I wanted to perform at this inaugural event. I knew I wanted George Strait to come perform at this inauguration," Abbott added. During a short speech before introducing Strait, Abbott recognized Strait's efforts to help Texans affected by Hurricane Harvey. The two visited Rockport, Texas, after the hurricane, where Abbott said Strait has a home. "We went to the parking lot of a hardware store in Rockport, and there were people there who had no power; some people who had no homes. But they showed up because George Strait gave 'em a smile and some hope and some inspiration to rebuild their lives," Abbott said. Abbott told the crowd he had only one challenge winning re-election: he's haunted by one of Strait's songs. "I was haunted by one of his songs because I knew that the only challenge I had in this election was I had too many exes who still lived in Texas," he said. Abbott defeated former Dallas County sheriff Lupe Valdez, a Democrat. Both Abbott and Patrick have now entered their second terms. Country singer Aaron Watson also performed several hits about an hour before Strait took the stage. RELATED: Today is Inauguration Day in Austin. Here's what to know.